A 1.3 Gigapixel image featuring around 70,000 people is lined up to create a world record for the most tagged online image ever. It has been created by stitching together 36 photographs of the crowd at Glastonbury Festival in the UK last week, while they were watching the England vs Slovenia World Cup match. The image is being used as part of a promotional site for mobile phone network Orange. 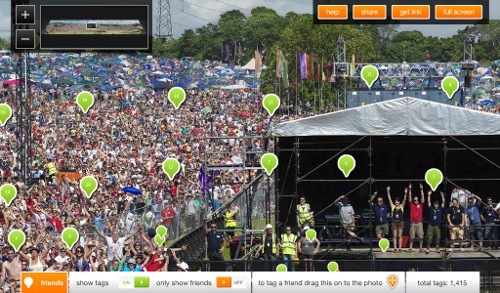 The Glastotag site is aiming for the record of ‘Most people tagged in an online photo’. Thanks to the sheer size of the photograph it’s possible to zoom incredibly far in, allowing you to make out indivdual members of the crowd, even those right at the back. Tagging is done via Facebook integration and at the time of writing nearly 1500 people had already been tagged in the image. 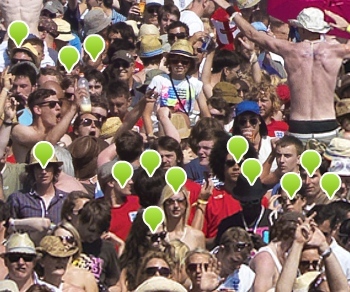 If you were there, or if you recognise someone who was, why not take a look and get tagging? A look at the Guinness World Records website doesn’t turn up any existing record for photo tagging, an it’s not currently one of GWR’s recognised Facebook records so if you take part you could be pioneering a small, but interesting, new landmark in the online world. Two Hasselblad H4D-50 cameras with 50 megapixel digital sensor backs, complete with a 150mm lens on the top and a 100mm lens with tilt shift adapter on the bottom were used to capture the extreme level of detail required for the photos. Read next: Tasks Touch screams simple elegant task management on the iPhone.